Azure Sphere 用のアプリケーションの開発やデプロイを行う前に、ボードをセットアップしてソフトウェアをインストールする必要があります。Before you can develop or deploy applications for Azure Sphere, you must first set up your board and install the software. Visual Studio 2017 Enterprise、Professional、または Community バージョン 15.7 以降。Visual Studio 2017 Enterprise, Professional, or Community, version 15.7 or later. Visual Studio のインストールを行うには、インストールするエディションを選択した後、インストーラーを実行します。To install Visual Studio, select the edition to install, and then run the installer. 任意のワークロードをインストールできます。何もインストールしなくてもかまいません。You can install any workloads, or none. 開発ボードは、USB 経由で PC に接続します。The development board connects to a PC through USB. ボードが差し込まれると、3 つの COM ポートが公開されます。When plugged in, the board exposes three COM ports. ボードを初めて差し込むと、ドライバーが自動的にダウンロードされてインストールされます。The first time you plug in the board, the drivers should be automatically downloaded and installed. インストールには時間がかかる可能性があります。ドライバーが自動的にインストールされない場合は、[デバイス マネージャー] でデバイス名を右クリックし、[ドライバーの更新] を選択します。Installation can be slow; if the drivers are not installed automatically, right-click on the device name in Device Manager and select Update driver. または、Future Technology Devices International (FTDI) からドライバーをダウンロードできます。Alternatively, you can download the drivers from Future Technology Devices International (FTDI). Windows のインストール (32 または 64 ビット) と一致するドライバーを選択します。Choose the driver that matches your Windows installation (32- or 64-bit). 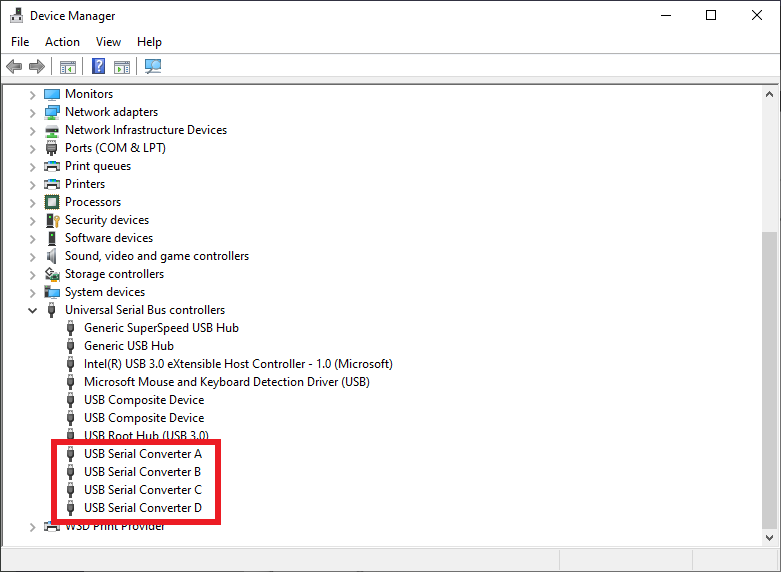 インストールを確認するには、[デバイス マネージャー] を開き、3 つの COM ポートを探します。To verify installation, open Device Manager and look for three COM ports. COM ポートの番号は、図に示されているものとは異なる可能性があります。The numbers on your COM ports may be different from those in the figure. 他のエラーが発生する、または 3 つ未満の COM ポートが表示される場合は、「インストールのトラブルシューティングを行う」を参照します。If other errors occur, or if you see fewer than three COM ports, see Troubleshoot Installation for help. 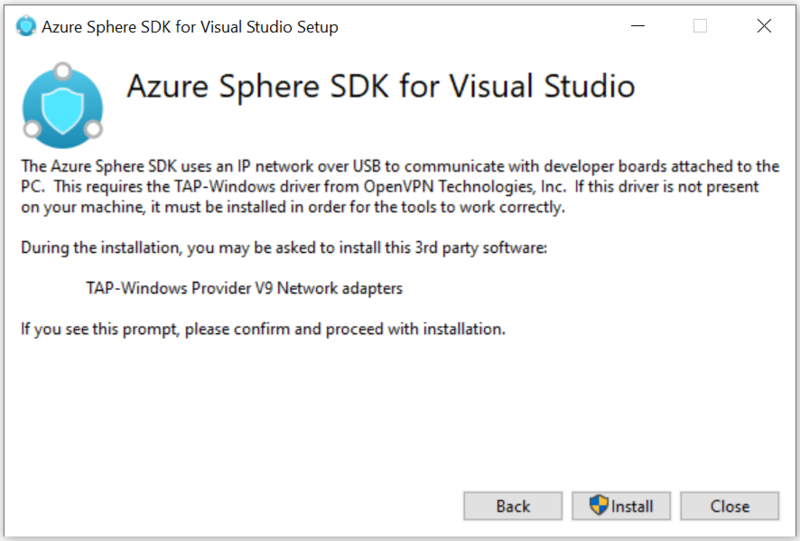 完全な Azure Sphere ソフトウェア開発キット (SDK) は、Azure_Sphere_SDK_Preview_for_Visual_Studio.exe によってインストールされます。Azure_Sphere_SDK_Preview_for_Visual_Studio.exe installs the complete Azure Sphere software development kit (SDK). 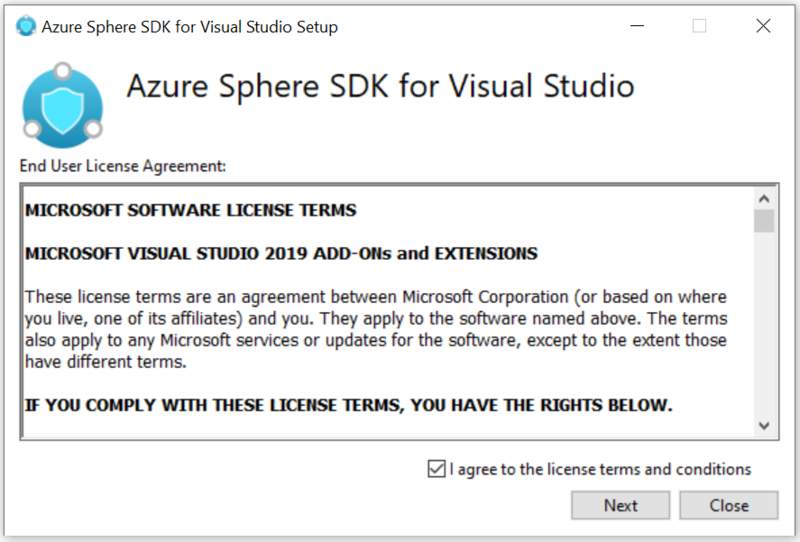 まだ行っていなければ、Visual Studio Marketplace から Azure Sphere SDK Preview for Visual Studio をダウンロードします。Download the Azure Sphere SDK Preview for Visual Studio from Visual Studio Marketplace if you have not already done so. ダウンロードしたファイルをお使いの PC に保存します。Save the downloaded file on your PC. ダウンロードした Azure_Sphere_SDK_Preview_for_Visual_Studio.exe を実行して SDK をインストールします。Run Azure_Sphere_SDK_Preview_for_Visual_Studio.exe from the download to install the SDK. ライセンス条項に同意し、[次へ] を選択します。Agree to the license terms and select Next. [インストール] をクリックして、インストールを開始します。Click Install to begin installation. 「This product requires Visual Studio 2017, Version 15.7 or newer (この製品には、Visual Studio 2017 バージョン 15.7 以降が必要です)」というメッセージが表示された場合は、お使いの PC 上に Visual Studio 2017 バージョン 15.7 以降がインストールされていることを確認します。If the message "This product requires Visual Studio 2017, Version 15.7 or newer" appears, ensure that Visual Studio 2017 version 15.7 or more recent is installed on your PC. Visual Studio バージョン 15.7 以降がインストールされていない場合、または Visual Studio の初回のインストール直後の場合は、「No product to install SDK on (SDK をインストールする製品がありません)」というメッセージが表示されます。The message "No product to install SDK on" may appear if you do not have Visual Studio version 15.7 or newer installed, or if you have just installed Visual Studio for the first time. このメッセージが表示された場合は、必要に応じて Visual Studio のインストールを更新するか、PC を再起動した後この手順に戻ってください。If you see this message, either update your Visual Studio installation if necessary or restart your PC and return to this step. 昇格時のプロンプトが表示された場合は、それを受け入れます。Accept the elevation prompt if one appears. セットアップが完了し、セットアップ アプリケーションによって要求された場合は、PC を再起動します。When setup completes, restart your PC if the setup application requests it. SDK は、お使いの PC 上の互換性のあるすべてのエディションの Visual Studio にインストールされます。The SDK is installed to all compatible editions of Visual Studio on your PC. この SDK では、Visual Studio のバージョン 15.7 以降が必要です。The SDK requires Visual Studio version 15.7 or later. インストーラーでエラーが返された場合は、アンインストールしてから、ツールを再インストールしてみてください。If the installer returns errors, try uninstalling and then reinstalling the tools. ツールをアンインストールするには、インストーラーを再実行するか、[設定] の [プログラムの追加と削除] を使用します。To uninstall the tools, rerun the installer or use Add and Remove Programs in Settings.